Only an hour and a half from the airport, Padangbai was the first stop on my Balinese adventure. Most people simply pass through this tiny fishing village to catch a ferry to Lombok’s Gili Islands, but after a long-haul flight I decided to stay in Padangbai for three nights, and I’m so glad I did. Ever since I booked my flights to Bali months before, I had been daydreaming about postcard-perfect beaches of white sand and blue seas. So you can imagine my delight when I discovered a place called White Sand Beach in Padangbai. True to its name the sand is bleach white (and very hot) and the sea was beautifully blue, although rougher than some. This actually made for a great laugh though, as I found myself lifted high with the waves and occasionally wiped out by the gentle tug of the undercurrent. There’s just something about rice terraces that have me swooning. When I got to Ubud I was like a kid in a candy store, a pig in slop, a dog with two tails. Basically, I was in heaven. My biggest recommendation for Ubud – or indeed the whole of Bali – would be to tear yourself away from the sprawling shops and touristy spots and, instead, go on the Rice Paddy Walk (see: Subak Junis Manis walk). It took my a while to find but, with the help of a hand-drawn map from my hotel and Google Maps on my phone, I stumbled across a small wooden sign saying ‘Rice Paddy Walk’ above an arrow pointing right. Central Ubud is busy with tourists, locals, touts and beeping bikes, so the contrast of having been in that environment just five minutes before made this peaceful haven even more special. I strolled around slowly, with nothing to rush for and nowhere to be. All there was was a panoramic scene of bright emerald rice terraces. Walking further, I came across what was to be my favourite bar in Ubud: Sweet Orange Warung. This small wooden bar served the most refreshing juices within an open-air structure, which meant I could continue looking out over the terraces in the shade, listening to music and drinking it all in. I almost fell asleep. The views continued to impress so, on a friend's recommendation, I left Sweet Orange, threw on a dress back at the hotel and ordered a taxi to Padi Organic – an open-air restaurant about a 15-minute drive out of Ubud centre. I was initially put off by how empty Padi Organic was but, after getting seated at the ‘tower table’, I soon realised I'd stumbled upon a hidden treasure. Our table was exactly that: an outdoor sit-around bench in a three-metre tower which overlooked field upon field of rice. Even better, the tempura prawns and chocolate and peanut butter pie was just as amazing as the view. The only time I get in a car at 2am is when I’m off to the airport to go on holiday. 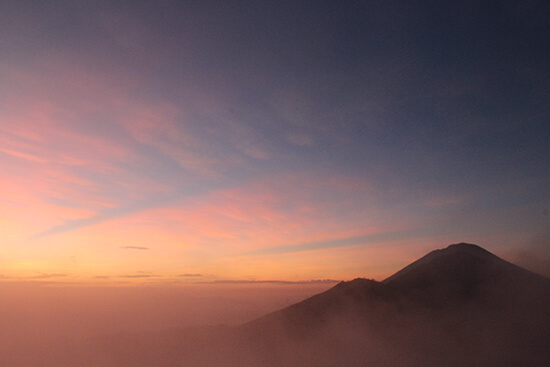 When it came to hiking up the active Mount Batur volcano to watch the sunrise though, I made an exception. Although I didn’t stay in Batur, I wish I had. 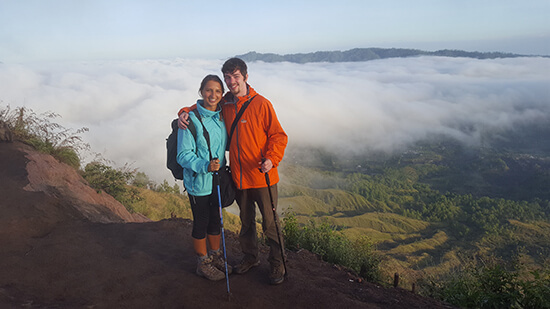 Hiking up to the mountain only took an hour and half and wasn’t as challenging as I had imagined, but it was pretty special to watch the sunrise over the other peaks and Batur Village, which has been built inside one of the world’s largest craters. The populated caldera is surrounded by beautiful mountains and, after I descended, I relaxed my aching legs in one of the local hot springs. But even more beautiful was Batur's still lake, dotted with local fisherman, each one patiently waiting for their catch of the day. In fact, it was so beautiful that I managed to reluctantly slide myself out of the steaming pool and into the cold changing rooms to get my GoPro – I just couldn't resist taking a photo of how spectacular my view from the pool was. Unfortunately, my GoPro decided not to charge the night before so I’m afraid that you, Mr/Ms/Mrs reader, are just going to have to go to Bali to see it for yourself. What a shame. 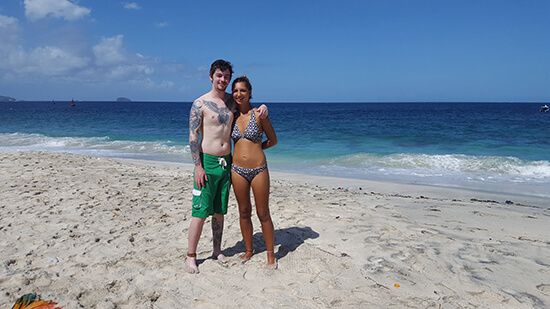 Helen discovered Bali on our of our beach holidays to this beautiful isle. To find out more about booking your Escape to Bali, speak to one of our Travel Experts over the phone, online or in-store.